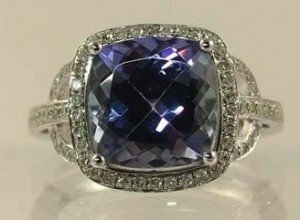 A 14 carat white gold tanzanite ring set with a 4 carat tanzanite surrounded with diamonds, with further diamonds set to the shoulders and shank. 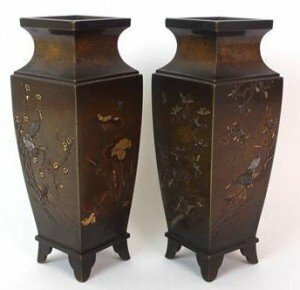 A pair of Japanese bronze square shaped vases, decorated in gold and silver with panels of lilies, prunus, morning glory and herons in flowering branches. 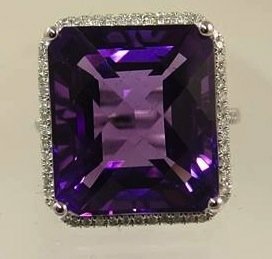 A 14 carat white gold amethyst and diamond ring set with a chequer board cut amethyst surrounded with diamonds, with further diamonds set to the shoulders. 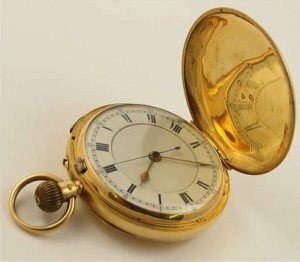 An 18 carat pocket watch with white enamel dial with black Roman numerals, gold hour and minute hands and black seconds hand. Hallmarked 18 carat Chester 1913. A superb Asch Grossbardt designer bracelet in 14 carat yellow gold with an inlaid panel of Lapis lazuli, malachite, onyx, mother of pearl and diamonds, to a flexible woven bracelet with an onyx inlaid clasp with safety clip. 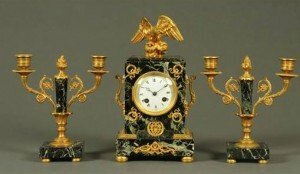 A 19th century French Empire style clock garniture, with variegated marble case with gilt metal mounts and two-train striking movement. 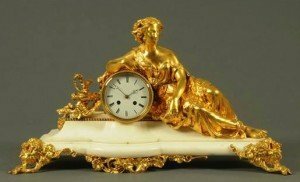 A 19th century French marble and ormolu mantle clock, with female figure to the right of the two-train striking movement and with decorative mounts and feet. 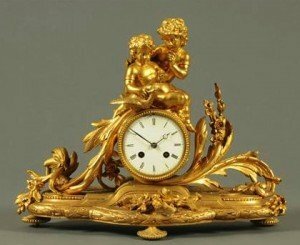 A 19th century French ormolu clock, with children and exotic bird surmount, the circular dial with two-train striking movement and Roman numerals. 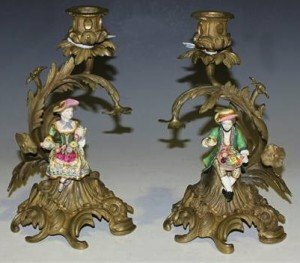 A pair of 19th Century French Rococo Revival cast ormolu candlesticks with applied porcelain figural mounts, the foliate nozzles and leaf sconces raised on scrolling stems and bases. 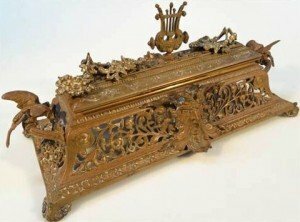 A late 19th century rococo brass inkstand, the rectangular hinged lid with a pierced top centred by a lyre and removable foliage, flanked by eagle headed handles above a part pierced stand terminating in shell scroll feet with raised satyr masks to each side. 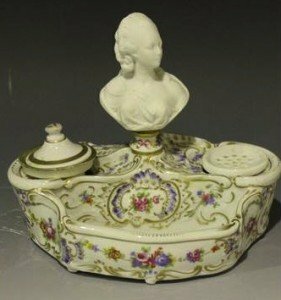 A French ‘Sèvres’ style porcelain inkstand, late 19th/early 20th Century, surmounted with a biscuit bust of Marie Antoinette above two wells within rococo scroll borders picked out in gilt, painted pseudo Sèvres mark to base. 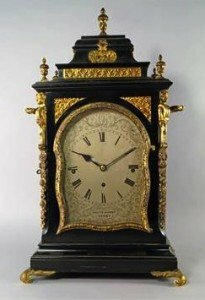 A large ebonised wood and brass mounted Victorian mantel clock by Whitehurst of Derby, with square bell form top and rectangular body, moulded with urn finials, with carrying handles and pierced metal work Rococo panels to the sides, applied with caryatid’s to the corners above pendant leaves and flower designs, on a stepped based, with scrolling feet, the silvered dial with Roman numeral chapter ring, framed by scrolling leaf and black filled engraved design. 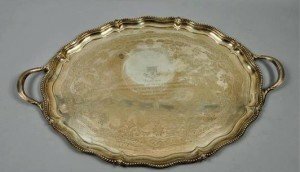 A late Victorian two handled tea tray of large proportion, with a raised and shaped beaded border, side carrying handles, with presentation plaque. 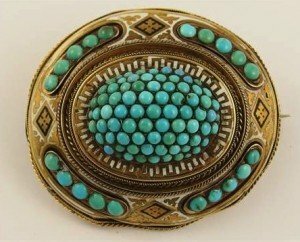 A Victorian enamel and turquoise set brooch, enamelled in black and white to the fine wirework and engraved ground, with pave set turquoises. 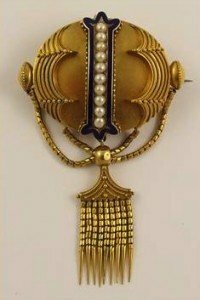 A Victorian yellow metal locket back brooch with chain festoon pendant, wire and grain decoration, and a central panel of blue enamel set with split pearls. 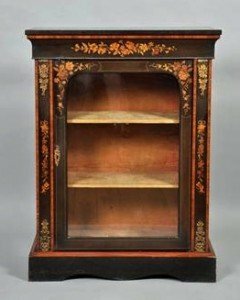 A Victorian ebonized pier cabinet with a shelved interior enclosed by one glazed door, with floral and marquetry decoration and supported on a plain plinth. 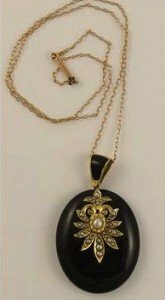 A Victorian mourning pendant in onyx black enamel and yellow metal mounts studded with split pearls, with a 9 carat fine trace chain. 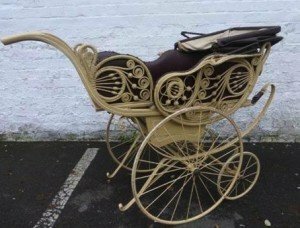 A Victorian painted two seat pram with leather canopy hood and front and rear facing seats, decorative pierced wicker sides on a suspended body and curved wooden handles above a pair of large rear wheels and smaller front wheels. 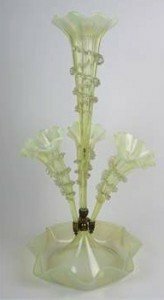 A Victorian vaseline glass epergne, central trumpet flute surrounded by three smaller trumpet flutes, all with ruffled rims and body encased in frilled ribbon, issuing from round dish with ruffled rim. 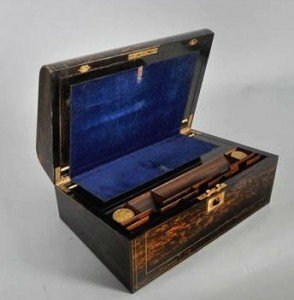 A Victorian coromandel writing box with fold over slope, brass edged and with line inlay, having a central motif, fitted with pen and ink compartments, a well over slope, letter and stationery compartments.